The Lost Kitchen was overwhelmed by phone calls from people wanting a reservation. Owner and chef, Erin French decided post cards would be the easiest form of requesting a seat. She received nearly 20,000 of them. FREEDOM (NEWS CENTER Maine) -- "We kind of grew up in a diner in the middle of nowhere, and I think as I grew up and spent more time in that kitchen and worked in that kitchen, I wanted to just get out of that kitchen, I didn't want to be in a restaurant for my life," quite a statement from a woman who has made a living and grown to international fame for her work in a restaurant. When Erin French started The Lost Kitchen, it was more out of necessity. French couldn't wait to leave her hometown of Freedom, and she did, but a tumultuous divorce brought her home again. She started hosting dinner parties, a form of forging a new path. Her cooking eventually led to space in an old building just down the road, which she renovated into The Lost Kitchen. "It was by default. It wasn't by design in any way," says French. 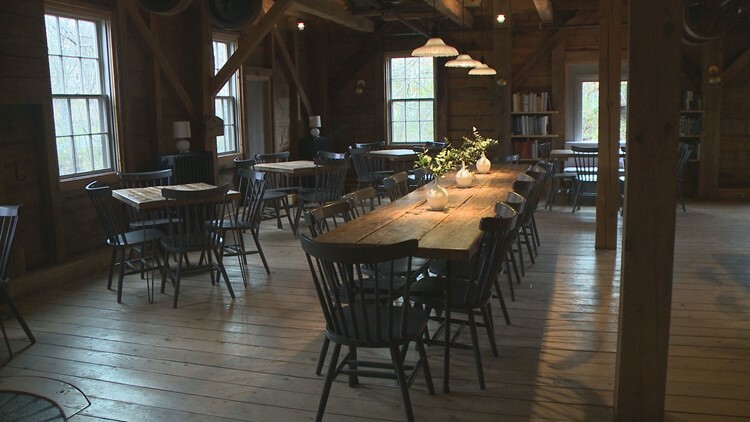 As the business model has evolved from a cafe offering lunch to a 4-hour dinner four nights a week during a season that has also been paired down, The Lost Kitchen's popularity has grown exponentially, inspiring a cookbook. Her phone system could no longer handle the amount of calls coming in for reservations, so in the spring French announced a new way to "apply" for a dinner seat: send a postcard. 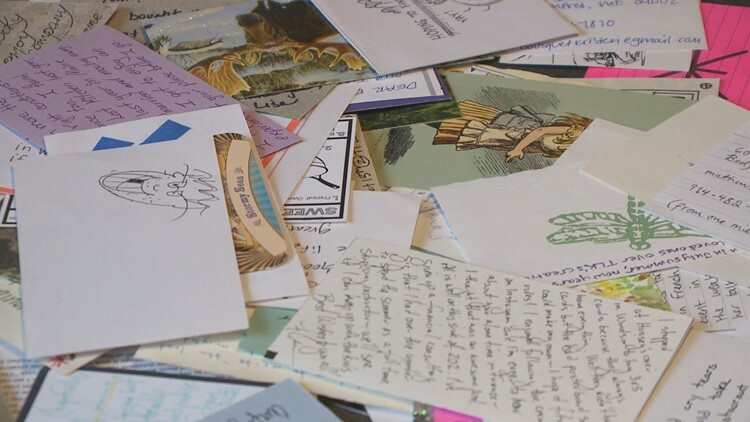 She received nearly 20,000 cards from all over the world. "We had one woman, when we picked her card and called her, she was on a train to Thailand," says French (and yes, that woman was ready to make her reservation). French says pairing down the right amount of people was actually easy. It was a lottery. All of the cards went into a bin and she and her employees took turns pulling one out. "Everyone has the same chance, which felt good to us," says French. "It gave everyone the same opportunity and it just took a little bit of effort. We decided if you didn't have the patience to write your name on a note card and pop it in the mail, you were not going to have the patience for a 4-hour dinner, so it was basically helping anyone out who wouldn't enjoy it." French and her team have read every postcard pulled, which she says helps prepare them for each dinner, getting to know a little background on each person before they sit down for an intimate dinner. People have shared stories with her about love lost, "she said that the only way that she would see him again was if he got a reservation at The Lost Kitchen because she knew it was nearly impossible." Postcard sent to The Lost Kitchen, for a reservation. New parents begged for a night out, and others poured their hearts out onto a 3x5 card. "The moment I read about Erin and her airstream kitchen, it became a goal of mine to dine at TLK with my partner in life, Charlie. We loved experiencing Maine, especially the local food scene! Sadly, he passed away 2 1/2 years ago to esophageal cancer - so cruel to the one who loved food and wine. But in his passing, I vowed to live life fully in his honor and take advantage of every new experience that comes my way. 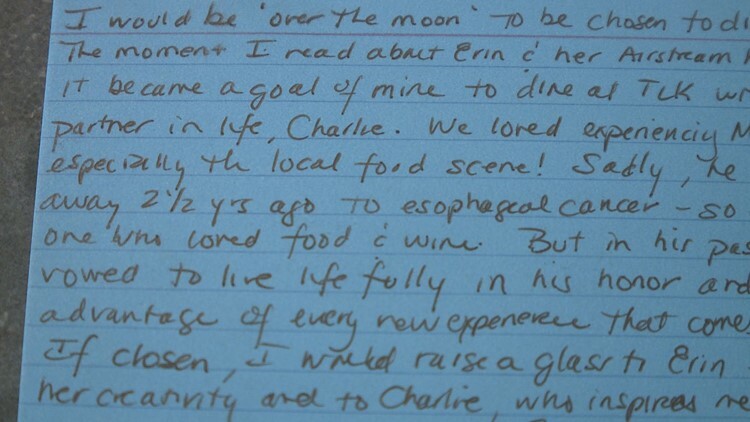 If chosen I would raise a glass to Erin for her creativity and to Charlie, who inspires me every day." French reads the card out loud and pauses to let out a sigh. "Yeah, that one's a tough one," she says. French has been completely caught off guard by the attention and admits, she isn't sure how sustainable a business around herself will be. As for reservations for the next season, French says they will likely go with postcards once again because the lottery system seemed to work well - but, you'll have to wait until next spring to know for sure.